One can not have too many simple pasta recipes. I’m certain that will one day be a universal truth. I find few things more satisfying than pasta. Doublely so when it’s uncomplicated. I subscribe to the Italian idea that when eating pasta, it’s all about the pasta and not about the sauce. The sauce merely accents the natural flavor of the pasta, not overpowers it. This recipe is almost too simple. 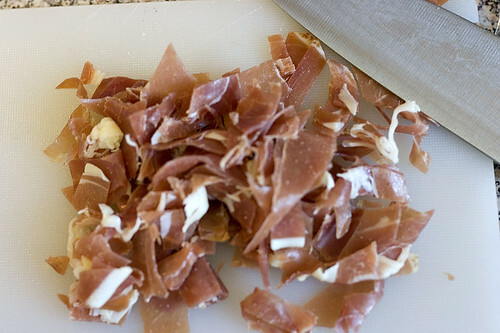 The prosciutto is cooked slightly in butter to release its flavor into the sauce. Then, tomatoes and a bit of cream are added to make the actual sauce. It’s cooked quickly so that the fresh flavor of the tomatoes shows through. A little bit of red pepper gives it a little bit of bite. And it’s served with enough cheese for it to be noticed but not so much that it’s feature attraction. I love recipes like this partially because they’re simple and fast but more so because the flavors meld together well. It’s balance and perfection. Melt the butter in a large skillet over medium-high heat. Add the prosciutto and red pepper flakes and cook for 30 to 40 seconds. Add the tomatoes and cream to the skillet. Season with salt to taste. Cook uncovered at a low simmer for 7 to 8 minutes or until the sauce has a medium-thick consistency. 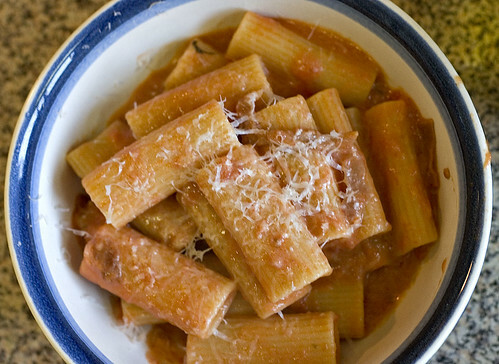 Cook the rigatoni in boiling water for 1 minute less than the instructions list. Drain the rigatoni and place in the skillet. Simmer for 1 minute stirring to coat the rigatoni completely. Serve immediately with the cheese sprinkled on top. My favorite pasta is rigatoni…I love it with a whole bunch of sauce and cheese, or maybe even some Italian sausage. Looks good.